Whoops! Maybe you were looking for Tattoo? 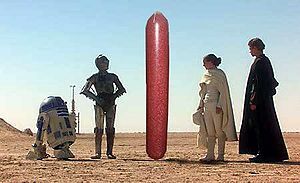 Stupid beeping robot, That Gay robot, giant sausage, Senator Armmadillo and Bananakin Skywalker on the planet of Yootapootapowpow. Yootapootapowpow is a planet in the Star Wars universe. The planet is home to Mr. Roark, Emperor Sun-Cantan Lon and many Sausage factories, where such appendages are manufactured by C. Bulbous, also known as The Doug or simply Doug. They are sold primarily at Sausage Hutt. The terrain has been said to suspiciously resemble that of the north African country of Tunisia. In Morocco, there's a sandcrawler in the Moroccan part of the Sahara oftentimes mistaken to be a recently opened hotel. Sinkholes on Yootapootapowpow are a common geological feature that appear in areas where the rock below the surface of the land is made from substances like salt beds, limestone, carbonate rock, carbonite, Soviet Russian Reversalists, headless clowns, and decapitated afronauts. Naturally-occurring sinkholes are also created by long periods of drought, or when caves with underground streams naturally give way to the power of mah moneh. More of them are created by misfired, misguided and missing Soviet nuclear missiles (1000000 as recorded by who?) which rammes into a wormhole and out above Yootapootapowpow, they normally slammed into the sand and exploded.